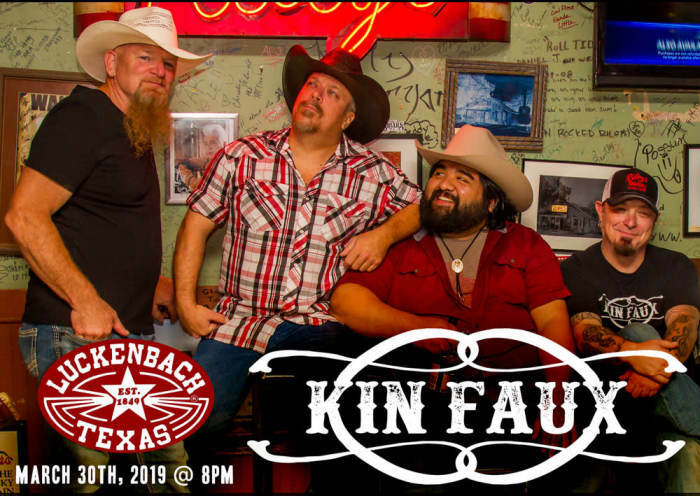 Kin Faux is a band of four talented musicians on a mission to put "western" back in country music. While they do pay tribute to country legends like Haggard, Jennings, and Cash, the heavy influence of the band comes from today's Texas music scene (i.e. Randy Rogers, Kevin Fowler, Cody Jinks, and Wade Bowen). What you will experience at a "Kin Faux" show is a solid rhythm section providing a foundation for blistering guitar and fiddle solos. What you will NOT experience are skinny, glitter-jeans twerking to Pop 40 Country. So, put on your wranglers and two-stepping' boots, then come see what the buzz is all about!